The end of a (not so) wee run. Woke up to the sound of silence, typical, this was the last day. I’d had fun in the highlands, and seen places I’d wanted to see. Today wasn’t just heading home though, we had tickets to go on the “funicular railway” at the Cairngorm Mountains. So, it was load up the bikes and head South, through Inverness and into the Cairngorms, which has some spectacular roads… but we would miss them… as we where heading down the A9 to Aviemore. By the time we got to the funicular railway, the clouds had come to meet us, and we couldn’t see the beautiful sights on the way up to the top. In the restaurant at the top the view was minimal, well, it looked like they had frosted glass instead of windows, but an overpriced coffee and a look round the gift shop later, it was enough to want to get back on the bikes. The journey was now at it’s end, the weather started to break, by the time we hit Perth, it was sunny and warm, and by the time we hit Glasgow, it was sunny, warm and rush hour. Time to practice some filtering… Now the most difficult part of the journey was here, planning where to go next year. Here’s the map. Day three started the same as day two, with the rain hitting off the roof of the caravan, but it didn’t last, and when I looked up at the sky, I could see a strange blue colour behind the grey that had followed us around the day before. 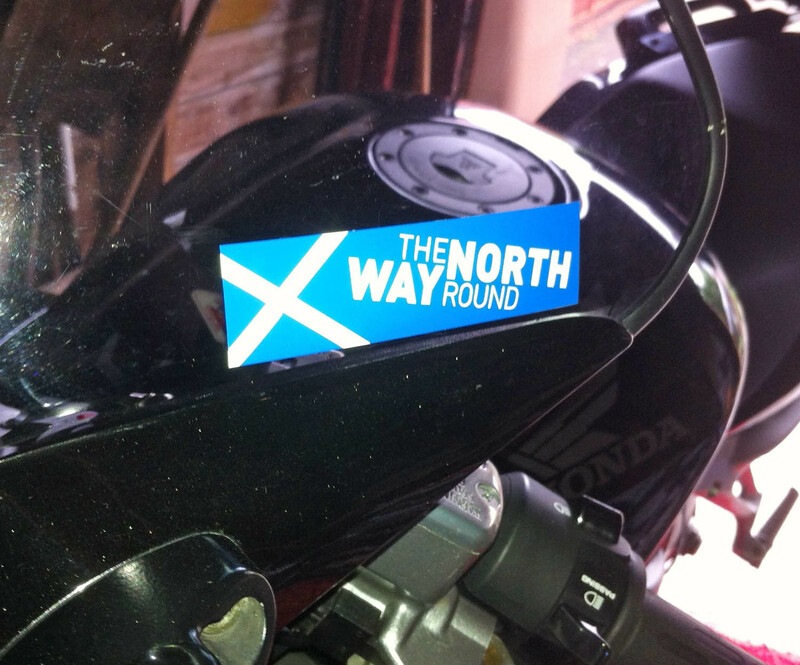 Today we were heading for John O’Groats, which is as fan North East as you can go on the mainland of Britain. The road was up the east coast with amazing views and some sharp hair-pin bends. We stopped off in Wick for some coffee and then headed up to John O’Groats. After taking in the sights, we were back on the road to Thurso, still finding it hard to keep an eye on the road with the beautiful scenery, large cliffs and beaches that look like they belong in a Spanish sea-side resort. Once I managed to get my eyes back on the road again we had reached Thurso, Time was once again against us so we headed back down the A9. Here’s the map. Day two started with me waking up to the sound of heavy rain hitting off the caravan roof, not the best sound to wake up to when you have a day of motorbiking ahead of you. A quick look at the weather report suggested that we change the trip from the North East to the North West, as the rain seemed to be hanging around the North East for the day. So we set out to head for Durness, passing Bonar Bridge and up to Lairg, only having a slight drizzle to deal with. Passing Loch Naver and Loch Loyal on our way to Tongue, the heavens opened up, and it was that “fine” rain that soaks everything, by the time we stopped at Tongue, a decision was made to have a hot lunch in the Tongue hotel and hopefully dry off slightly before we hit the road again. Fed and watered, we got back on the bikes and headed to Durness. A few minutes on the road and we stopped on the road at Kyle of Tongue. The weather seemed to have took pity on us as it had stopped raining. Further along the road we stopped at a nice beach, and Smoo Caves. After passing through Durness, we headed south and stopped for a coffee in some scenic locations. The day was getting on, so we headed south, down the side of Loch Shin, on to Lairg, then back to the caravan, for some more coffee and to dry out some clothing for tomorrows adventure. Heres the map. The journey starts from Paisley and we head north to Loch Lomond, the weather is overcast, which is a lot better than the predicted showers that BBC Weather app has informed us. Just as we hit the Erskine bridge, I remember that I have left the maps sitting in the kitchen, annoying, as I had carefully put “x’s” at every potential petrol station. I thought was fully prepared before I set off. The only traffic was up the side of Loch Lomond, after Tarbet, but apart from that, it was great all the way up, just past Fort William where we stopped for some petrol. After the re-fuel, we stopped at a place called “Letter Finlay” which is on the banks of Loch Lochy. From the lay-by where we had some lunch, we continued heading north up the side of Loch Ness, and then managed to miss the rush hour in Inverness. Further north we crossed the beautiful Moray Firth, Cromarty Firth and Dornoch Firth, before we arrived safely at the Caravan Park “Grannie’s Heilan Hame”. Time for a cold refreshment and sit with the feet up before two days in the Highlands. Here is the map.